A new version of the Android Facebook application has been launched, and this time it works more as you'd expect it to. 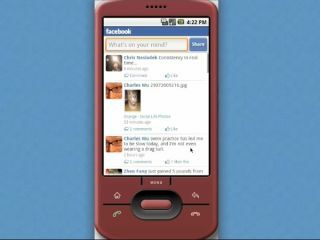 The first Facebook for Android application was a little on the basic side, with elements like being able to see news and status updates being the main talking point. But the new upgrade brings the ability to browse friends' profiles from within the application itself rather than having to jump to the browser, which obviously makes things a lot slicker. You can also navigate through your friends' photos as well - something that makes obvious sense seeing as it was possible natively on the HTC Hero already through the Sense UI. However, it's not the complete package, as there doesn't appear to be any support for messaging or chat yet. The original application was only released in September (to much confusion) so it's good to see the rate of change is working at a decent pace. However it's still not in the same league as the iPhone Facebook application, so we'll have to wait and see how long that takes.